Meet us at our office and transfer to Mughal sarai railway station. Train departure at 10:35 am .Overnight journey in train. Meals: Basic Dinner in Train. On arrival at 05:25 am at Puri railway station transfer to hotel in Puri. Later half day sightseeing of puri after lunch where visit Lord Jagarnath Temple. Overnight in Puri. After breakfast half day tour of puri. Later after lunch transfer to Bhubaneshwar. On the way visit Sun temple in Konark. Overnight in Bhubaneshwar. After breakfast full day tour of bhubaneshwar and nearby historical caves. Later transfer to bhubaneshwar railway station in for journey to Chennai. Train departs at 21:20 to Chennai. Overnight in train. On arrival in Chennai at 17:15 transfer to hotel. Overnight stay in Hotel. Meals: Lunch in train, Dinner. In morning at 5 am drive to Tirupati Balaji. On arrival take special darshan and later in evening return to Chennai by 10 pm. Overnight Chennai. Meals: Breakfast, Lunch & Dinner in train. After breakfast local tour of Chennai and later transfer to railway station after Lunch and take train at 17:30 to Kanyakumari. Overnight in train to Kanyakumari. On arrival at 6:50 am transfer to hotel later after Lunch local tour of Kanyakumari. Overnight in Kanyakumari. In morning drive to Madurai. 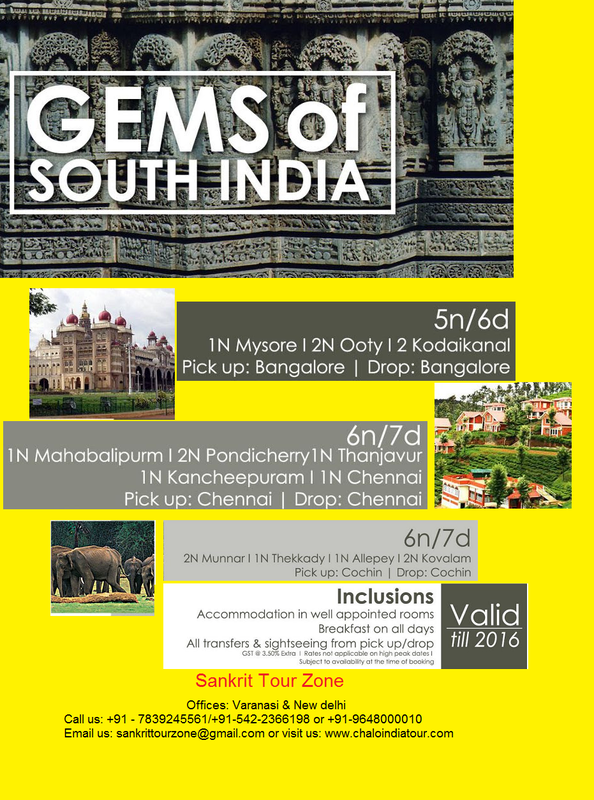 Later visit very famous meenakshi temple & local tour of madurai. Overnight in Madurai. Day 10: Madurai to Rameshwaram. After breakfast transfer to Rameshwaram. Later local tour of Rameshwaram. Overnight in Rameshwaram. After breakfast day on leisure for packing and shopping. Later in evening catch train for Varanasi. Day 12 Train Journey - See ultimate India from train. Basic Meals in train: Breakfast, Lunch & Dinner. Day 13: Basic Meals in train: Breakfast, Lunch & Dinner. Day 14 at 4 am reach to Varanasi.